Just like our DIY solar heating kits, we also offer the same pre-packaged and pre-engineered solar water heaters for commercial applications. Our Commercial Solar Heating Packages come in 4 different collector sizes each with a corresponding solar storage tank. 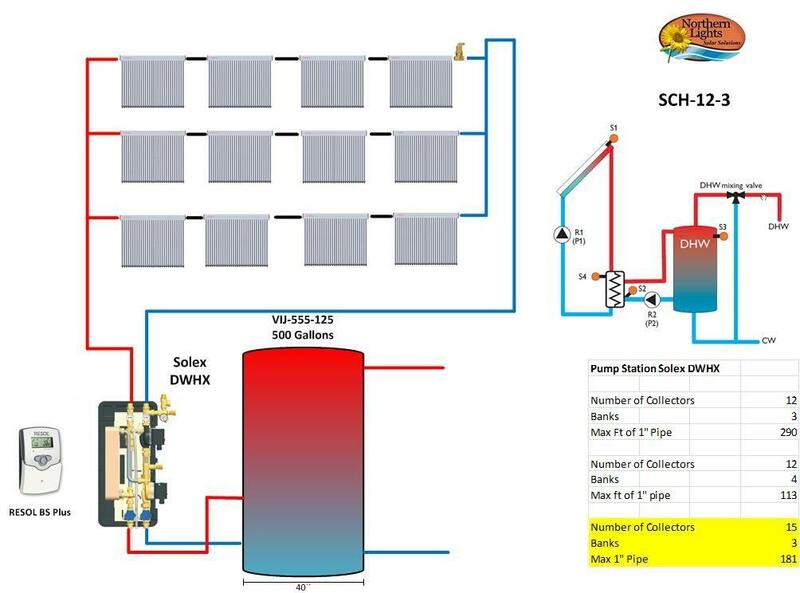 The Solex DWHX heat transfer station manages the energy exchanger from the solar side to the application. The systems come complete with 1" insulated stainless steel flex hose that simply connects with our brass connection fittings (NO Soldering Required). The complete commercial heating package comes with every item you will need in easy to follow instructions. Need a Larger Commercial Heating System? Simply run two systems in parallel. Two CSH-16 will provide the same power as 32 collectors, However the advantage of this system is redundancy. Should one system experience a failure, you still have a second operational system. We can offer FREE design support to help you determine what the best size would be for your heating application. We also provide you with a comprehensive solar simulation based on the recommended packaged and your application. In this way you can get a 1st hand look at the financial savings before you commit to the project. Quick installation: Plug n' Save Technology means your system is installed in days not weeks!